Father’s Day this year is on Sunday 18th June 2017. This celebration originated in the US and has been officially acknowledged there on the third Sunday in June since 1966. 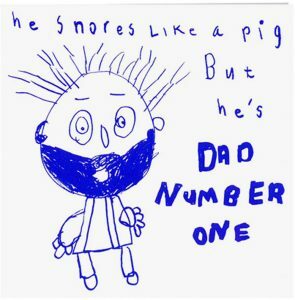 It is a time for families to show their appreciation for their fathers. 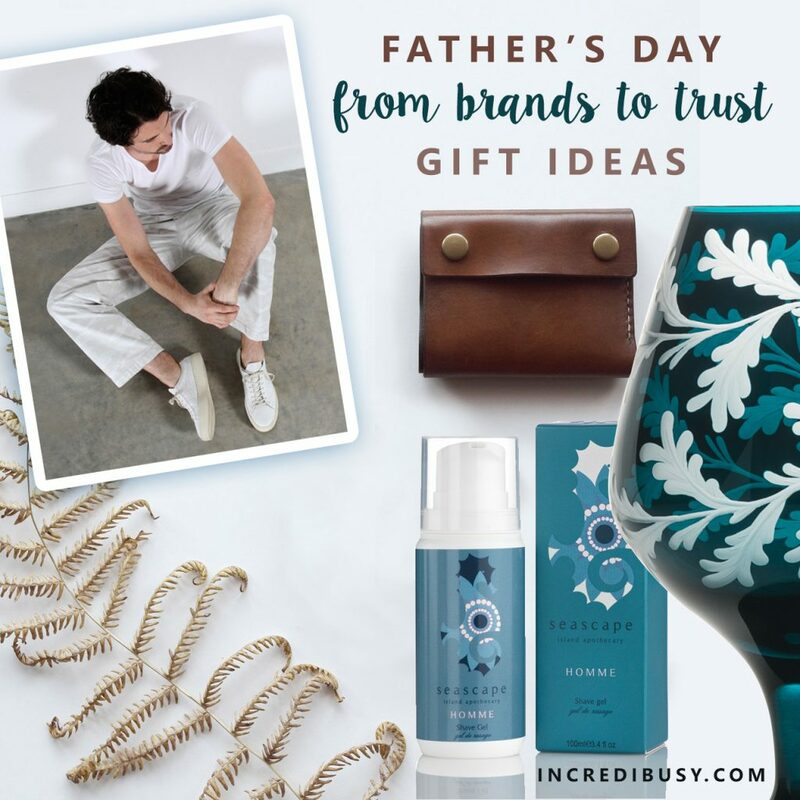 I’ve also included a couple of other brands, KT Robbins ceramics, Ethical Superstore, Lewes Map Store, Thought Clothing, Bio Bean who are also good people I think you should know about = Father’s Day Gift ideas from brands to trust. The Soveral founders Jorj and Alexandra had the dream of building a unique beauty & perfume brand that would put into practice cutting-edge science to best make use of the purest and finest natural ingredients. 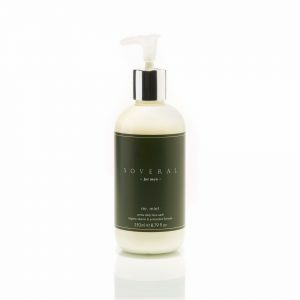 All products in the Soveral range are designed by Alexandra Soveral and Jorj Aleem. Alexandra is the perfumier and cosmetic formulator, whilst Jorj creates concepts and defines of how the product is presented. The Mr Mint Face Wash is A lightly foaming daily face wash, which cleans whilst gently moisturising. Infused with organic mint, this sulphate free face wash gently removes grime without stripping the skin, leaving it fresh, clean and ready for the day ahead. It is also SLS, SLES and Paraben free. All products are created with ingredients sourced locally on the island of Jersey. Each range features infusions of unique, hand-blended, natural essential oils offering many therapeutic benefits to help balance personal care and well being. 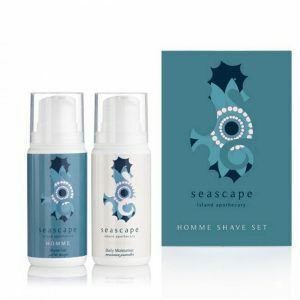 This Homme Shave Set includes a 100ml Shave Gel and a 100ml Daily Moisturiser. No parabens, no silicones, no SLS, no petroleum, no artificial colours, no artificial fragrances. Weleda products are 100% certified natural and 84% of all plant ingredients are classified as being organic and Biodynamic quality. No synthetic fragrances, colourants or preservatives are used and there is absolutely no animal testing. Weleda believes in operating sustainably and ethically throughout the whole business and continuously challenges itself to reduce the impact we make on our planet. This eco-friendly drawstring wash bag contains Men Active Shower Gel 200ml, Shaving Cream 75ml and Moisture Cream for Men 30ml. ​Luca Jouel is a boutique Australian fine jewellery brand that is committed to using ethically sourced materials to create sophisticated heirloom pieces. Each piece of Luca Jouel fine jewellery is custom crafted by expert jewellery makers in Australia using special hand-finishing touches designed to give the pieces a sense of the organic and timeless. Creating pieces replicating the natural tusks, teeths and horns found in Africa’s wildlife, Pembe Club boasts hand carved designs made in the UK, reflecting a contemporary yet effortless style. 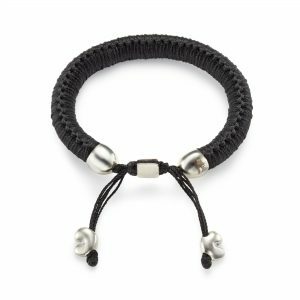 These cotton bound bracelets, with sterling silver baobab seeds were created in collaboration with URU diamonds to raise funds for PAMS Foundation in Tanzania. PAMS Foundation is a Tanzanian organization working with communities, rangers and law enforcers in and around wildlife areas, providing training, environmental education, human-wildlife conflict mitigation and wildlife protection. The chartwellandg Breeze Pocket Square is handmade in London with washed crêpe de Chine silk and features two delicate hand-rolled hem edges and two hand-frayed edges. As with all chartwellandg pieces, it features the hand-embroidered white signature detail in one of the corners. chartwellandg is a pioneering British luxury resort wear brand creating handmade clothing and accessories. In a conscious move away from mass production, chartwellandg is redefining luxury resort wear – focusing on purity and minimalism to create refined, relaxed and timeless pieces with artisanal details. Hand-rolled hems, mitred corners, hand-plaited leather, silk covered buttons, and the hand-embroidered detail are all signatures of chartwellandg. 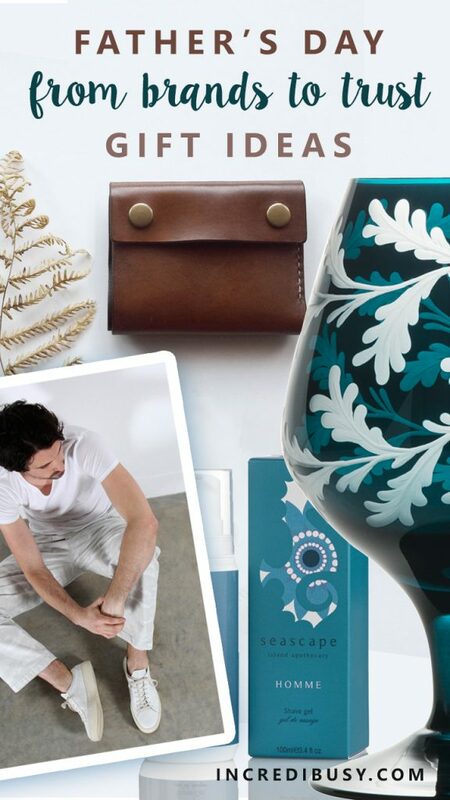 Founded by a husband and wife team who both grew up in New Zealand and have made London their home, chartwellandg was created with the desire to create a business that was rewarding in the wider sense. chartwellandg is joining the revolution. We passionately believe that luxury should be synonymous with integrity. All fabrics and materials used within the chartwellandg collection are proudly sourced and consciously constructed in Great Britain, including the accessories and signature packaging. The supply chain is compact, practices sustainable and the team are treated as part of the family. The award of the Butterfly Mark recognises chartwellandg’s devotion to producing high quality products with craftsmanship and sustainability at the heart of every step. For suggestions on how to fold Pocket Squares, take a look at chartwellandg’s folding guide. 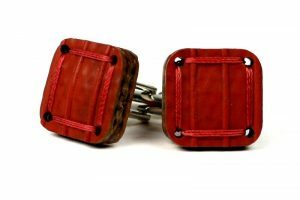 The Elvis & Kresse Torpedo Cufflinks are made from genuine decommissioned fire-hose. If you want to make these unique cufflinks even more individual, etched personalisation is available, by laser etching directly into the fire-hose. Cufflinks are hand-stitched and presented in a reclaimed printing blanket box. Available in red, yellow, black or blue hose. Elvis & Kresse have been reclaiming heroic materials ever since they fell in love with London Fire Brigade’s decommissioned fire-hose. After a distinguished career fighting fires and saving lives the hoses were destined for landfill. Elvis & Kresse started to rescue it in 2005 and never looked back. 50% of the profits from the fire hose range are donated to the Fire Fighters Charity. More materials soon followed, as Kresse has always had an obsession with waste and likes nothing better than discovering and intercepting something new. The challenge is the same every time – what can they do to prove value, change perception, and respect these resources. Karmoie is a Norwegian independent eyewear brand born from the desire to combine the world of fashion with a meaningful and life-altering contribution. Karmoie aims to create beautiful, uncompromising eyewear while also contributing in a committed and conscientious way towards a better future. For every pair of frames sold, a pair of corrective glasses is given to a person in need. Designer Kirsten Iversen finds inspiration in the nostalgic elegance of exquisite vintage styles, combined with Scandinavian aesthetic and details from industrial design, while adding her own twist to keep them contemporary and fresh. Focusing on clean lines, an organic color palette, and a lightweight comfortable fit, Karmoie eye-wear are understated, modern classics. All frames and parts are made entirely in Italy. 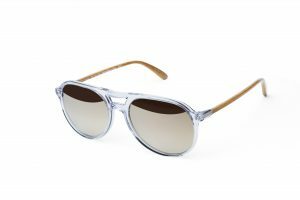 Karmoie seeks to excel in every aspect of business, from the quality and unique aesthetic of their frames, to the use of sustainable and animal friendly materials. Integrity is at the heart of the company’s culture. The name Karmoie is drawn from the Sanskrit word karma meaning “action” or “deed” and the French word joie or “joy”. To Karmoie, it is the joy of doing good for others. It represents the feeling they wish their customers to experience when wearing Karmoie eyewear. 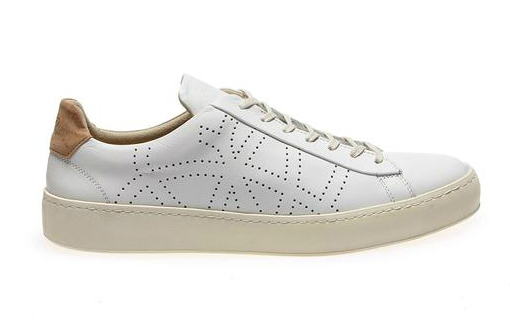 “Shoes with a good sole”… Could these be the freshest addition of Po-Zu’s latest collection? 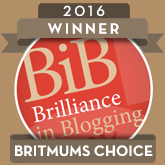 We certainly think so! Po-Zu is a London-based award-winning sustainable footwear brand, launched in 2006, and currently ranked as the UK’s Number 1 Ethical Shoe Brand by The Ethical Company Organisation. The word Po-Zu stems from the Japanese ポーズ, meaning ‘to pause’. 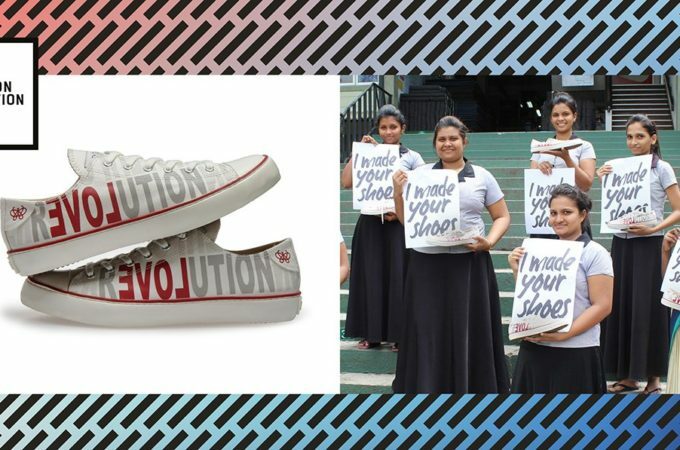 It is their mission to provide feet with unique respite from the frantic pace of busy lives, and to halt the damage that modern footwear manufacturing often causes to people and planet. T heir biomimicry designed Foot Mattress™ is based on the coconut husk’s natural shock-absorption property. Its purpose in nature is to soften the impact when the coconut falls from the tree, and to protect it from breaking when it hits the ground. The Foot Mattress™ moulds to the shape of the foot for exceptional cushioning, whilst providing superb climate control and air circulation. One of their customers described Po-Zu shoes as “like sinking into your favourite sofa”. The materials they use come from either natural or renewable sources. They contain no pesticides, bleaches or toxic dyes and are locally sourced wherever possible. Po-Zu has incorporated some groundbreaking ideas such as glue-less shoe constructions that are designed for disassembly, a multipurpose compostable shoebox, and an edible shoe cream. Po-Zu run small-scale production lines in partnership with their Portuguese shoe factory, which upholds a strict non-toxic policy, operates on over 70% renewable energy, and recycles over 95% of their industrial waste. As part of their ethical policy Po-Zu donate 3% of their total online sales to four environmental charities: The Resurgence Trust, Pesticide Action Network UK, Earth Community Trust, and Environmental Justice Foundation. 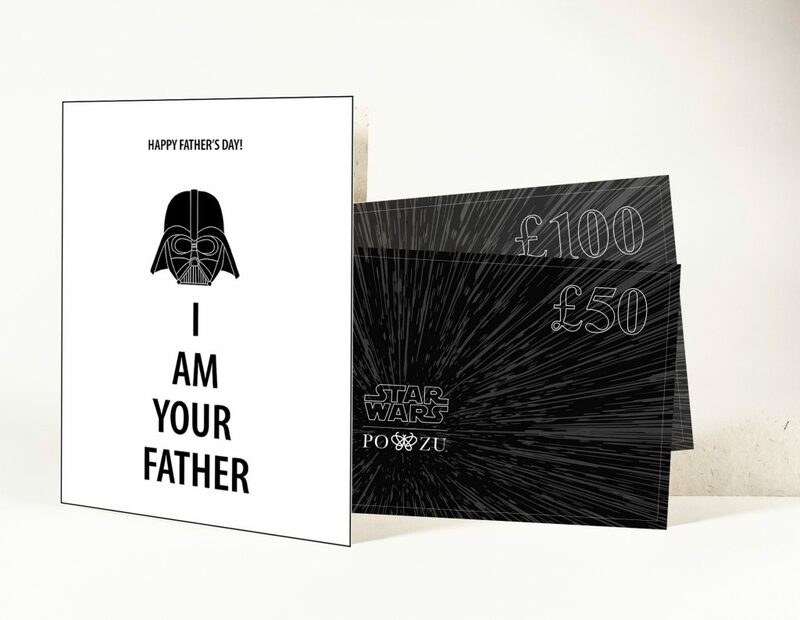 Oh and if you’ve spotted their amazing collaboration with Star Wars / Lucas Films / Disney and you think your Dad would LOVE a pair of boots or shoes, you can buy him a ‘promise’ which will arrive in the form of special Star Wars themed gift vouchers, and a fabulous Darth Vader ‘I am your Father’ gift card for you to personalise…. The world’s most premium vodka of Polish original – Three essential steps; Rye, Water and Character. 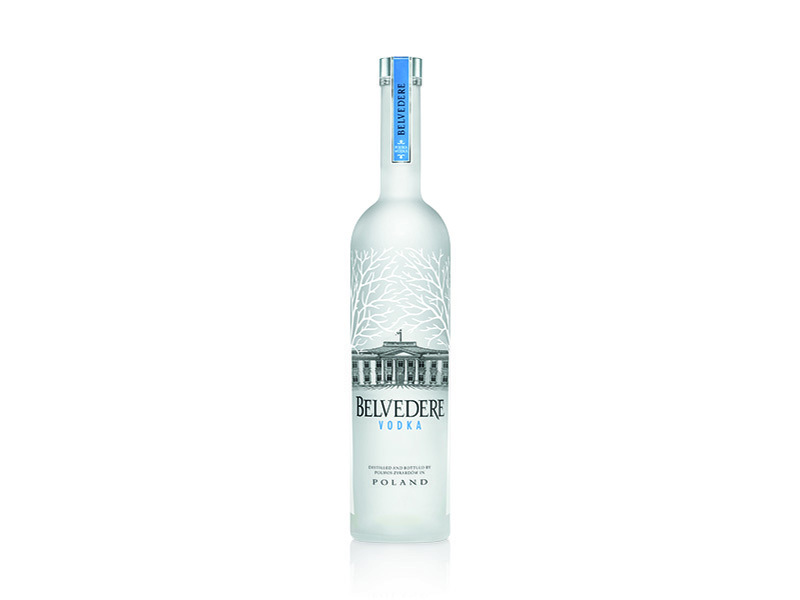 Belvedere Vodka is a luxury brand of Polish vodka produced and distributed by LVMH. It is named after Belweder, the Polish presidential palace, whose illustration appears on the company’s bottles. It is produced exclusively in Poland in the town of Żyrardów and has worldwide distribution. Belvedere produces a variety of flavoured variants of their vodka. All Belvedere vodka uses Dankowskie Rye along with pure artesian water from their own wells and is distilled four times. Belvedere knows the difference in the production of their world’s original luxury vodka, and they also make a difference. 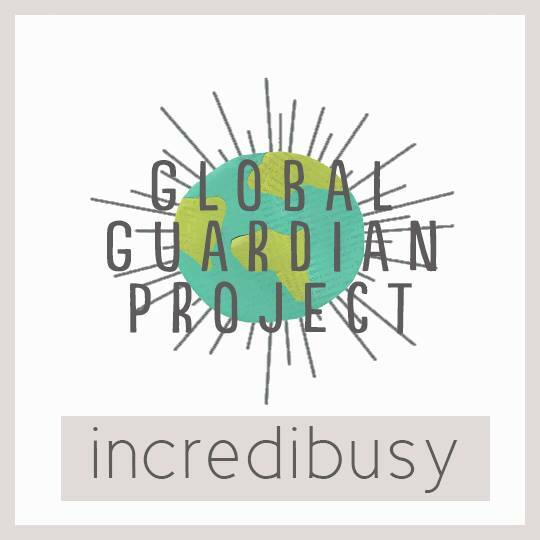 It is a brand that has put in place a global social and environmental responsibility action plan, based on five pillars: reducing its environmental impact, sustainable farming, involving local communities, responsible consumption and social engagement. Rococo’s House Truffle made with Madagascar chocolate is enrobed in dark chocolate and finished in cocoa powder. Silver medalist at the International Chocolate Awards 2012 and Gold Medalist at the Academy of Chocolate Awards 2013. A wonderful introduction to artisan ganaches with Madagascan Criollo and Trinitario chocolate flavours. Plenty of bright red berry flavour in the chocolate, this is one for chocolate purists. 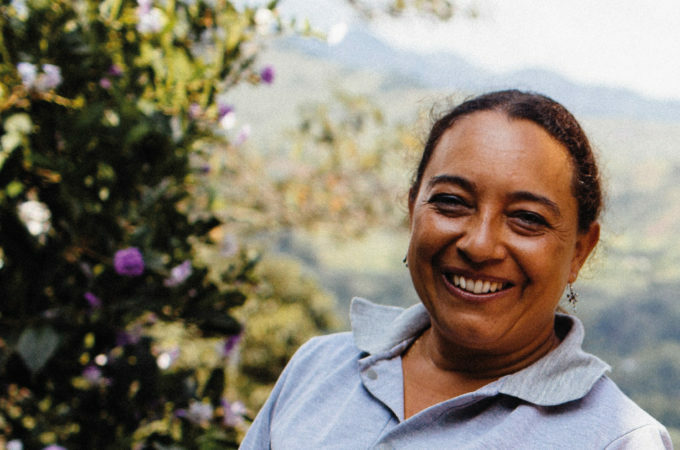 In 1983, Chantal Coady founded award-winning luxury chocolate brand Rococo Chocolates, a renowned brand that sells globally online, with major retailers and has four shops throughout the UK, all the while supporting ethical trade for cocoa farmers. Rococo’s impressive CSR credentials include no animal testing, complying with global labour standards and using recyclable packaging. They are FSC-certified and make efforts to reduce their greenhouse gas emissions across the company. In 2004, the year that Hurricanes Ivan and Emily hit Grenada, Rococo worked with their good friends at the Grenada Chocolate Company to support them through this difficult time producing the ‘the Hurricane Emily’ chocolate bar where all proceeds went to ‘Hearts And Hands’ – the Grenada Relief Fund. Following this project, in 2007 Rococo teamed up with the Grenada Chocolate Company and purchased a small cocoa farm, affectionately called ‘Grococo’, so they would be able to produce their own fairly traded, ethical chocolate. More than three decades, four shops and five books later (all about the joys of luxury chocolate of course) Chantal is still pioneering the movement for real chocolate, inspiring many through warm and inviting shops, delicately nuanced flavours and creative, beautiful packaging. In fact, the Academy of Chocolate made an award to Chantal and Rococo for ‘Changing the way People Think About Chocolate’ and the Wall Street Journal among others recognized her as the founder of the ‘New British School’ of chocolate. In 2014 Chantal Coady was awarded an O.B.E. in the Queens Birthday Honours ‘For Services To Chocolate’ recognising her long and groundbreaking career. 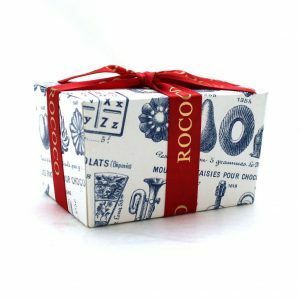 All of Rococo’s organic products now include their own Grococo beans… Perfect for a feelgood sweet tooth! Alexandra was first introduced to backgammon in the alleys of Cairo while taking a stroll with her Egyptian step-grandfather as a child. Over time, as her travels broadened, her interest in the game evolved. After countless games of backgammon with people from all over the world, Alexandra was fascinated by the idea that board games operate as an independent vocabulary requiring neither common language nor culture. 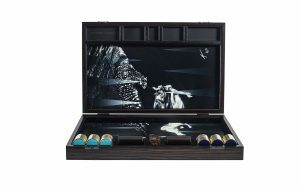 Alexandra’s backgammon collection was launched in December 2010 comprising of six backgammon boards – Palm, Pheasant, Butterfly, Nudes, Antler and Peacock, all can be personalised with initials or messages. Each board comes with weighted aluminium playing pieces or you can order exquisite semi-precious stone and brass bespoke playing pieces. In addition, Alexandra also takes one-off commissions for games tables and boards. Each backgammon board is made by hand and Alexandra works with a team of master craftsman specialising in different techniques and materials. Alexandra has worked on a range of special projects celebrating traditional techniques of artisans all over the world. Made with love and personalised, you can now send this alpaca wool bedding set to a loved one with bespoke monogramming – perfect for an extra special Father’s Day treat! 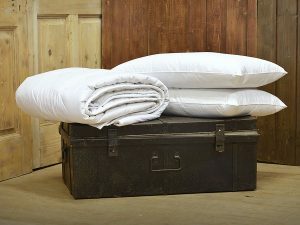 Penrose Products are manufacturers of Natural Fibre Luxury bedding and soft furnishings using Alpaca fibre and Sheep’s Wool. 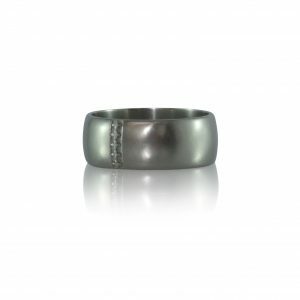 They pride themselves in producing natural goods that are affordable and of the utmost quality. They are a family run business that hand make all of products in their Nottinghamshire workshop, and ensure they all get the personal touch. Penrose Products only use materials that have been sustainably sourced and they strive to limit waste by using every bit of fibre and fabric, all products are “Vegetarian Society Approved” because all the animals go back to the paddock after shearing. 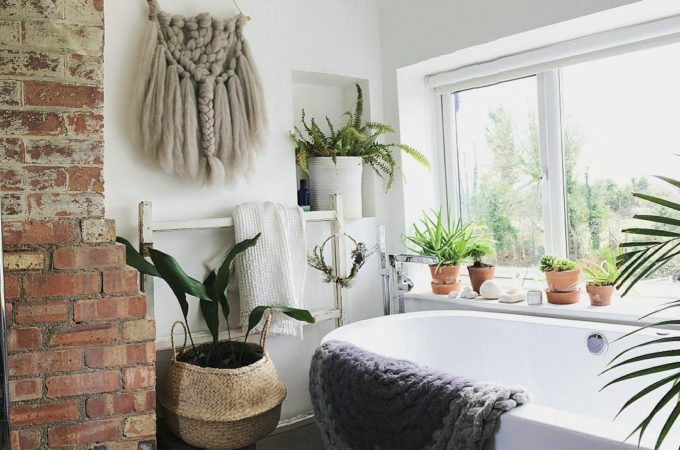 They’re truly passionate about the benefits of this rare wool; it produces some of the softest products and gives amazing comfort, and they want to share this luxuriousness with their customers. Their promise is to provide the highest quality products, and the best customer service possible. Penrose Products have over 30 years in the manufacturing industry, and it is from this that they have successfully established and maintained such high values. As a UK manufacturer, they are strong supporters of the British rural economy and have established a supply chain of raw materials within the UK that enables them to keep their fibre miles to a minimum and to proudly be a manufacturer that is 100% UK focused. They build successful working relationships with all of their suppliers that will be maintained for years to come. The Duck cognac glass, in peacock crystal makes the perfect gift for the gentleman who enjoys the finer things in life! 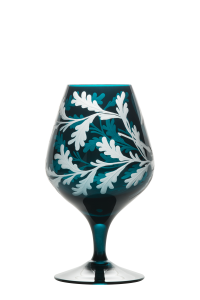 The elegant and sophisticated cognac glass features a wide bell shape to concentrate aroma and intensify the flavour. It also makes a versatile addition to any existing crystalware collection. Rachel Bates was established in 2012. Following Rachel’s experience as an interior designer, Rachel developed the brand with sister Katie Goodwin, to produce a luxury e-boutique experience for clients which launched in 2015, based on exquisite craft and joyful colours through Rachel’s own-label collections and exclusive collaborations. From the outset, the key elements for product designs were very clear; everything produced must always be stylish, colourful, elegant, exquisite, of beautiful quality and craftsmanship and produced by some of the finest manufacturers and artisans in the world. 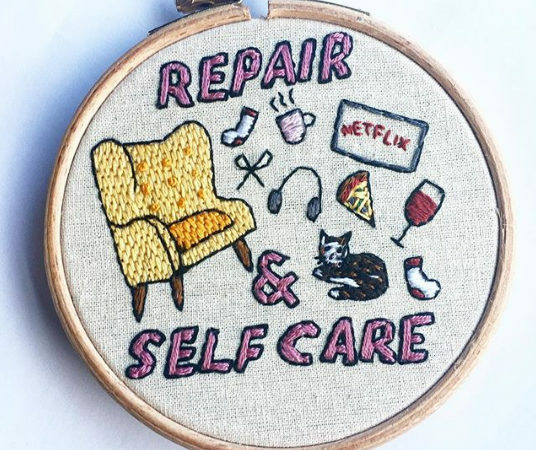 Rachel Bates products are produced to the highest standards, always using the best quality materials, made by hand by incredibly skilled craftsmen and artisans. Both the launch collections and brand edits are a reflection of Rachel’s own personality; vibrant and captivating. 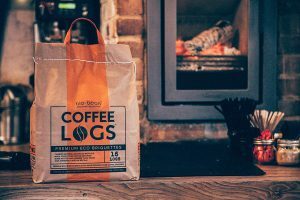 A new carbon neutral solid fuel – recycled from coffee! yes seriously – Burns hotter and for longer than wood. 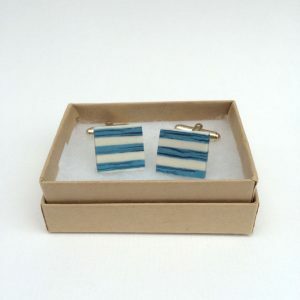 Handmade in the UK, these simple cuff links are made from ceramic, porcelain, sterling silver. A dad can clearly never have enough cuff links – and these beauties are from Midlands-based ceramicist Katie Robbins – Smooth, tactile and translucent are the qualities that have drawn Katie to porcelain – Following a career break after having children she started to follow some creative pursuits and, under the guidance of a renowned ceramic artist, Sue Dyer, at The Midlands Art Centre, Katie has developed a true passion for porcelain – we featured Katie’s work previously on our Mother’s Day article here. The cutest Father’s Day card – silk screen printed by hand, this 15cm x 15cm quality card 240gsm watercolour paper, comes with white envelope. 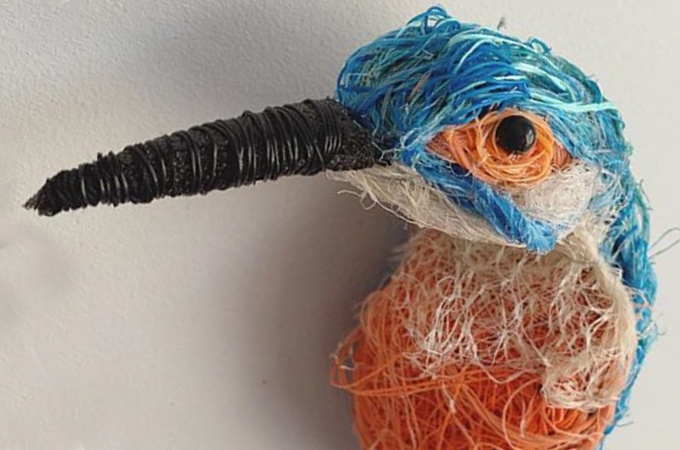 Arthouse Meath presents the skills and talents of men and women living with complex epilepsy, learning and physical difficulties, with each artist bringing skills to the enterprise. Instructors enable groups or individuals to create artworks which are then developed into designer products for sale. 100% of sales revenue goes towards sustaining the enterprise, helping it to grow and evolve. 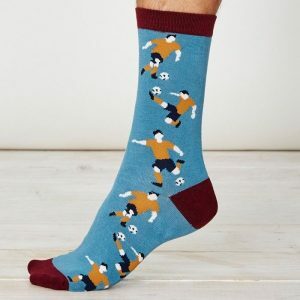 And really we couldn’t finish this round-up without the most traditional of Father’s Day gifts – SOCKS! 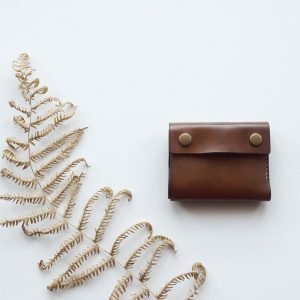 Beautifully curated online store Lewes Map Store have some beautiful Father’s Day gift ideas – Designed and handcrafted in a little workshop, tucked away in South Derbyshire, England, this beautiful men’s wallet is made from 100% chrome free, natural British vegetable tanned leather. It is hand dyed from a non-invasive dye and hand stitched using un-bleached natural Irish linen thread. 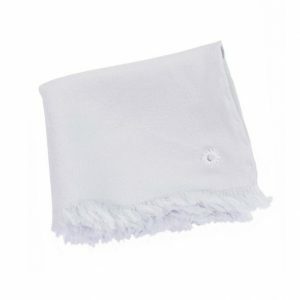 This product comes wrapped in tissue paper and a linen bag, including a card when the product was made and who by. 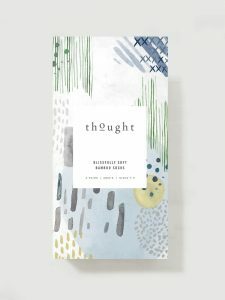 Made with bamboo, organic cotton and spandex – Thought’s consciously-crafted, sustainable socks use some of the planet’s strongest, softest and most eco-friendly fabrics. Naturally antibacterial, hard wearing and thoughtfully designed to let your feet breathe and relax. And this gift box will have you chuckling – two pairs of funky stripes, and two pairs of ‘Dad hobbies’ – football and cricket! A perfect tongue in cheek gift! Positive Luxury connects brands and consumers that care. The mission is to inspire people to buy better and influence brands to do better. The Butterfly Mark is recognised as a guarantee of commitment to excellence across all areas of sustainability.